are set up in the convenience of your home, alleviating the stress and time associated with travel and affording you the comfort and privacy you desire. can be easily arranged as well; we will assist in locating a facility in your area that is both convenient and can accommodate your group’s needs. 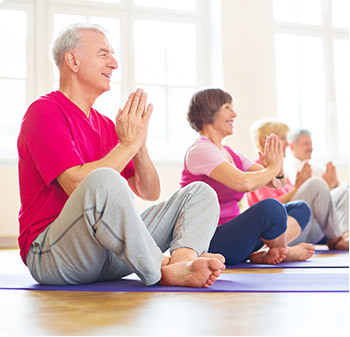 Yoga is great for seniors, as it effectively addresses many issues associated with an aging body, while being a safe and pain-free form of exercise. Strengthens Muscles: Yoga is a form of resistance training that can overcome and significantly delay loss of muscle mass and strength. By using your body weight in yoga, as opposed to dumbbells, you are far less likely to get injured. Strengthens Bones: With increased muscle strength, comes increased bone density. Studies have shown that yoga can prevent osteoporosis and relieve pain from an existing condition. And several studies have also shown you can actually gain bone by practicing yoga. Improves Balance and Range of Motion: Falls do not just happen and people do not just fall because they are older. Falls are caused by a variety of reasons, including lack of balance and lack of muscle strength. Yoga has been shown to significantly improve balance, coordination, stability, and overall functional mobility. 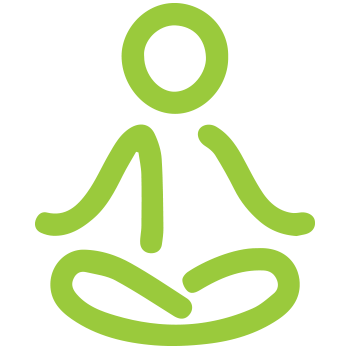 Keeps the Mind Sharp: Yoga engages both the mind and body. Unlike mindless and repetitive workouts such as weight lifting or using workout machines, it requires the practitioner to concentrate and be engaged visually, aurally and tactilely. Reduces the Stress of Aging: Viewed as a holistic stress management technique, yoga has been shown to even out one’s moods, reduce depression and decrease stress. 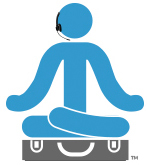 Regular yoga practice will help achieve tranquility of the mind, a sense of well- being and an optimistic view on life. Beginning a gentle yoga practice is an excellent way to stay active in a safe manner as well as lower stress levels, and keep the mind and body healthy. Chair yoga is a versatile prop that allows the practitioner to refine their movements and be more mindful, without the fear of falling. It is also an excellent tool to isolate the top half of the body from the bottom half, allowing greater access to each. For example, your chest and shoulders can benefit from certain arm poses, that you can more easily do when you are not worrying about also balancing on one leg. Spinal twists can be more effective as well, as the chair prevents the rounding of the spine that often happens when we sit on the floor. Gentle or adapted classes should not be equated with a lack of ability, as everyone can benefit from chair yoga, regardless of their level of fitness.